Can you believe that Christmas is less than 6 months away? I know that might seem like a long time, but it will be here before you know it! Two years ago, I decided to commit to a 100% cash Christmas. I can’t tell you how nice it was in January to not have to stress over credit card bills or to have to worry about how we were going to pay things off! If you want to join me in my journey to have a 100% cash Christmas this year, it’s not too late! Over the next few weeks, I’ll be highlighting ways that you can earn extra money to stash for Christmas. One of the ways I add to my Christmas fund is by completing surveys! If you haven’t checked out Survey Spot yet, you should! When you sign up, you fill out a quick survey about your interests and then they will send you surveys based on your interests and demographics. When you get an e-mail about their survey opportunities, be sure to hop on it because sometimes they fill up quickly! You will earn points for completing surveys which can then be exchanged for cash (via Paypal) or gift cards for retailers such as Amazon.com (the Amazon sales are HOT at Christmas! ), Sears, Lowe’s, Overstock.com , and Kmart! Start getting paid for surveys today! Sign up for Survey Spot here. If you’re already a member of Survey Spot, what do you think? If you want to complete surveys with more reputable survey companies check out E-poll, Opinion Outpost, and Mysurvey! 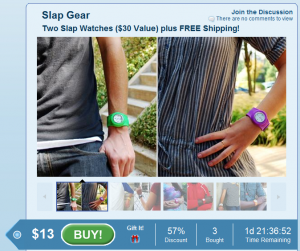 Savemore: Two slap watches as low as $3 + free shipping! I grew up in the 80s, and it’s been fun (and in some cases horrifying) to see so many 80s trends make a comeback. These slap watches are another blast from the past! If you’re looking for a fun stocking stuffer for tweens and teens, this is it and you can grab two of them for as low as $3 including shipping! They’ve got 11 different colors to choose from! If you’re NEW to SaveMore, sign up here and you’ll get a $10 credit just for signing up! Redeem your credit to “buy” the slap watches, which are priced at two for $13, so you’ll only have to pay $3 out of pocket! Plus, shipping on this item is FREE! If you’ve already signed up for SaveMore, you’ll pay just $13 for this! NOTE: I have ordered many different offers from Savemore including a teeth whitening pen, nail polish, and canvas prints, so I can assure you that they are a “legit” company. When you purchase this offer, you will receive a voucher that you will need to redeem for your Slap Watches at Slapgear.net. Christmas Gifts on a Budget: fully loaded teacher tote bag! I’ve worked in education for 13 years now and I think most parent’s would be surprised to know that most teachers would REALLY love school supplies as a teacher gift! I know it sounds crazy, but they pay for many “supply” items out of their own pocket and they go through them very quickly! Right now, school supplies are on clearance for up to 75% off at many stores, so it’s a great time to stock up on school supplies for teacher gifts! For a more “personal” touch, you can grab one of these free tote bags from Vistaprint and personalize it and fill it with all these items! The bag is FREE, but you do have to pay $4.41 for shipping, which is still a great deal! 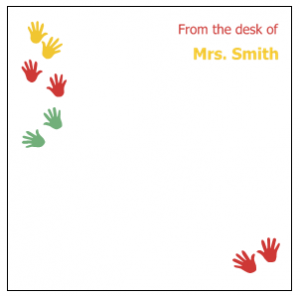 You can grab personalized sticky notes for free, too! 2. Choose an image (there are lots of “educational-themed” images to choose from). You can add your personalized text in the upper left hand corner. Please note that any “extras” you add will result in extra charges. I have ordered from Vistaprint many times and have always had great experiences! I plan on throwing in an Amazon gift card code that I earned for FREE from Swagbucks, too! I think I can give my kids’ teachers a fully loaded tote bag for under $10 each if I take advantage of the school supply deals now! Christmas Gifts on a Budget: free photo calendar! Yes, I’m already talking about Christmas here! I firmly believe in staying within a budget for Christmas. For the past two years, our family has done a “cash Christmas” and I can’t tell you how nice it was in January to not be haunted bycredit card bills! One of the ways I’m able to stay within my budget each year is by shopping for Christmas gifts year round! Here’s another “Christmas gifts on a budget” idea for you! Do you struggle to come up with gift ideas for grandparents that seem to have everything? What about a photo calendar? 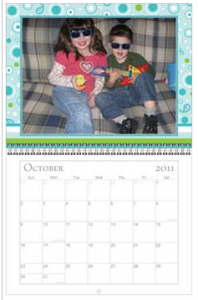 You can make a photo calendar FREE right now through Vistaprint. You do have to pay shipping, which is $5.67, but that’s still a bargain! Stay tuned for more “Christmas on a budget” gift ideas! Do you have a “Christmas on a budget” idea to share? Comment or send me an e-mail! Christmas Gifts on a Budget: teacher gifts! Now is the time to take advantage of those clearance sales on school supplies! 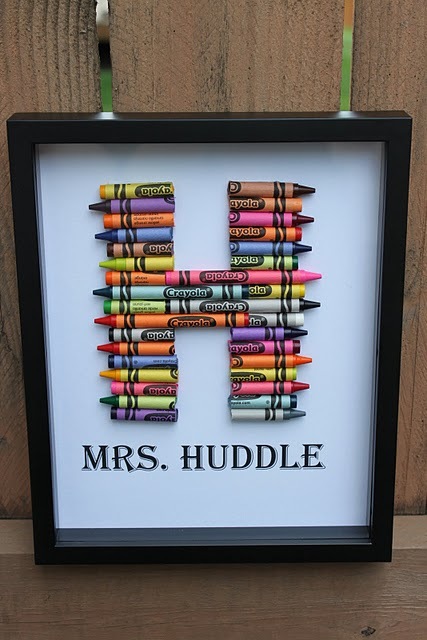 You can get crayons for as low as $.20/box and make some really cute teacher gifts! If you’re really a savvy shoppe and have some things “on hand” already, you can probably make either one of these gifts for under $5! I LOVE these crayon monograms! I found this picture at BMoore Celebrations. 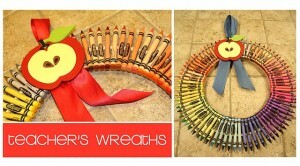 These crayon wreaths are so cute, too!